I love networking – in person or online. I love to meet new people, share stories, and often find out what a small world it is! Online networking and social media let you really see the connections like friends of friends, shared interests, and new opportunities. Over the past year, I’ve connected with many of my twitter and blog friends on LinkedIn. I noticed a few months ago that many of them started joining food related networking groups and thought that it would be a good idea to join too. Not long after joining the Food Blogger Connection group on LinkedIn I saw a post from Jonathan Boring, Social Media Marketing Manager from the California Wine Club. He was looking for everyday wine drinkers who would be interested in trying out some of their wine selections. The criteria for reviewers were pretty simple; bloggers without expert wine knowledge. That’s me! While I’ve been honing my tasting skills, I do not consider myself an expert in any way. I generally know what I like and have a preference for roses, cabernet francs (or blends with it), and whites on the drier or grassier/citrusy side (very technical description). And after my trip to Spain last year, I’ve been seeking out new and interesting Spanish wines to try. Back to the California Wine Club - a family business that has been shipping wines since 1990. A quick look at the website will give you a great overview and history of the business. Bruce and Pam Boring select wines to send out as part of their monthly wine club. They have a variety of different memberships – from all California producers to small international wines to aged cabernet. They work with smaller wineries that produce limited quantities. For us here in the Northeast, that might mean wines that aren’t available regularly in our neck of the woods. I was worried that I wouldn’t be able to participate, due to the restrictions on wine shipping to MA. However the California Wine Club ships by certified freight carrier, so the wine was promptly delivered right to my door. 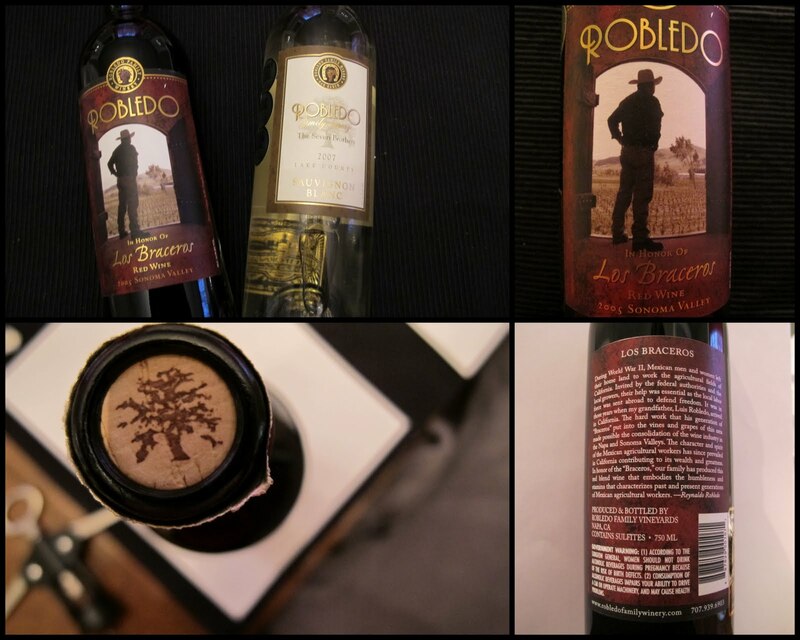 For my first review, I received two bottles from the Robledo Family Winery in the Sonoma/Carneros area of Sonoma. The well packed bottles came with a 12-page booklet describing the wines, the winery and winemakers, recipes, and information about more wine club offerings. This shipment included a 2005 “Los Braceros” Red blend and a 2007 “The Seven Brothers” Lake County Sauvignon Blanc. This post will cover the red wine, Los Braceros Red Blend. The wine is a blend of equal parts Cabernet Sauvignon, Merlot and Syrah. The tasting notes in the booklet were extensive noting awards, the color, flavors, aromas, weather conditions, aging process, recipes and more. The suggested retail for this wine is $30 and the restaurant price is listed as $45-$50. The wine was bottled in July 2007 and released in September 2008. Only 3000 cases of the wine were produced. I decided to taste the wine alone, and then incorporate into a recipe and enjoy it with the meal. Using skills I’ve picked up at various wine tasting events, I started first by pouring a glass and observing the color. A nice, deep red (almost a self portrait up there!). Next, I swirled and sniffed. Then a small sip to let it spread over my tongue. Spicy, peppery, and tangy with a little bite. Using a very scientific explanation – it made my tongue tingle and want to take another sip. Not my favorite in terms of red as a sipping wine, but I could see how you would like this wine if you liked a spicy and peppery red. For me, I thought I would like it better with food (and I did). I could imagine it paired with a nice juicy steak right off the grill. The recipe included in the booklet was a recipe from Maria Robledo for Chiles Rellenos. She picked a bold and spicy dish to pair with the family’s red wine blend. I decided to make a bold red wine tomato sauce and meatballs to pair with the wine. I started by pulling all of the vegetables out of the refrigerator and chopping them into equal sizes for sautéing. In incorporated the wine while sautéing sliced mushrooms. I let the wine come to a bubble and reduce with the mushrooms. The mushroom sauce would have been delicious on its own topping grilled chicken or steak (note for next time!). It had a beautiful color, aroma, and flavor. I paired the sauce with homemade meatballs over spaghetti and served with toasted bread. The wine gave the sauce a great kick and depth of flavor and paired well as a drink. I’m excited to open up the Sauvignon Blanc next and share my review. I think it will be a perfect companion to some of my favorite spring dishes. Don’t forget to check out the California Club website. They have a few different membership options and a lot of fun information about the wineries that they work with. What’s nice about their membership is that you don’t have to commit to a full year – there are no joining fees and you can cancel at anytime. You can also pick all red or all white and pick shipments for monthly, every other month, or quarterly delivery. If you do decide to check them out, make sure to mention that I sent you. You can also keep up with them on their Facebook page. I made these on a Sunday and had plenty of leftovers for lunches and dinners throughout the week. I served them with pasta, as subs, and just on their own. Serve with sauce and pasta or on a toasted roll with cheese! Disclosure: I was sent two bottles of wine at no charge from the California Wine Club to review. I was not compensated financially. The opinions are completely mine! Yum, I love making a good red wine sauce with meatballs. I love everything about this post: wine, tomato sauce, meatballs. What a nice meal!